what happens to our young protagonist." Orphaned and alone, young Juan Caraveo flees from his cruel master in the lowlands of central Mexico to seek his missing father in the fabled mountains of the west. Fear and necessity drive him into the service of thieves and adventurers, wise men and holy men. A mythic tale, in the picaresque tradition, Juan Caraveo recounts the outrageous and gripping adventures of a peasant youth who, through his wits and determination and the influences of his many masters, reaches a fearless and honest manhood despite the adversities of his humble origins. 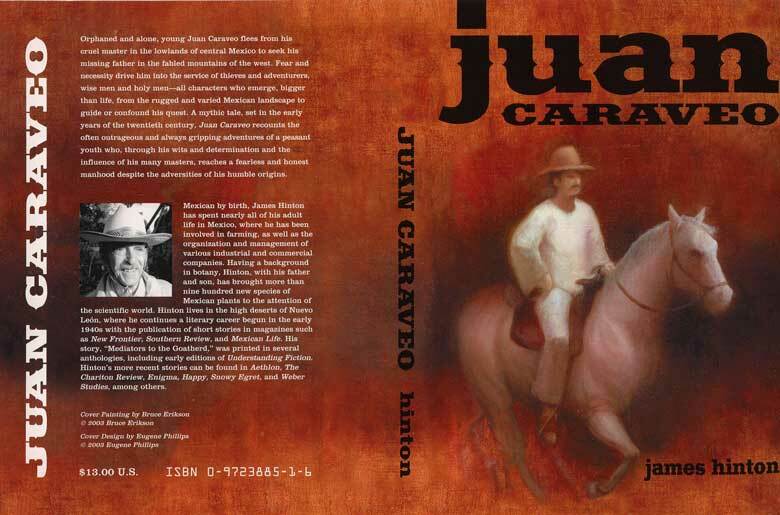 Juan Caraveo, by James Hinton, tells the story of an orphaned cowherd, who in order to save himself from the whip of a cruel master and the taunting of a vicious ranch foreman, known as "The Fear," flees in the night, only to be tracked and followed, first in reality and then in his imagination, by the remorseless, El Miedo. "Fear" subsequently drives young Juan into the protection and employment of numerous other masters: vicious thieves and honest men, men of great courage and men of greed, lazy and hard working men, wise and holy men, as he travels ever westward to seek the father whom he has never known, reputedly last seen in the high mountains of the distant west. Set in the rugged Sierra Madre del Sur, intimately known to Mr. Hinton through many years of botanical exploration among its peaks and valleys, the story of Juan Caraveo is placed during the time preceding the early twentieth century agrarian reforms in Mexico, a time when the lords and peasants of remote areas were still living lives of nearly medieval simplicity. It is a simple and highly moral tale, in which, young Juan, learning something from each of his many masters and inspired by the love of a beautiful peasant girl, Rosario, whose life he saves from the first and most evil of his mentors, finally vanquishes El Miedo and achieves a noble and well-earned manhood. It is also a first rate work of literature. Rare as it seems, occasionally a novel comes before us which, through the beauty of its language, the clarity of its conception, the range of its concerns, and its connection to all that truly matters, marks it as a work that will endure. Yet Juan Caraveo also represents a unique blend of traditional and modern literatures, in part for its poetic narrative, which incorporates elements of Spanish sentence patterns and vocabulary, Shakespearean verse, and Homeric heroic energy, but also through its structure and vision. A rare modern example of the Spanish picaresque novel, in which, typically, an orphaned boy makes his way in life by allying himself sequentially with various masters, Juan Caraveo clearly takes its place as a descendent of the sixteenth century anonymous work Lazarillo de Tormes and can be ranked along side a number of English novels, written under the influence of the picaresque tradition, such as Tom Jones and Moll Flanders. At the same time, the sheer vigor with which Mr. Hinton portrays the bigger-than-life, swineherds, priests, thieves, saints, and muleteers, who comprise Juan's mentors, not to mention the numerous minor characters, and the detail with which he portrays the lush and varied landscapes in which the action of the story unfolds, mark Juan Caraveo as an example of the magical realism employed by other contemporary Latin American writers such as Gabriel Garcia Marquez and Isabel Allende. A Mexican by birth, JAMES HINTON has spent nearly all of his adult life in Mexico, where he has been involved in farming, as well as the organization of various industrial and commercial companies. Having a background in botany, Hinton, with his father and son, has brought more than 900 new species of Mexican plants to the attention of the scientific world. Hinton lives in the high deserts of Nueveo Leon, where he continues a literary career begun in the early 1940s with the publication of short stories in magazines such as New Frontier, Southern Review, and Mexican Life. His story, "Mediators to the Goatherd," was printed in several anthologies, including early editions of Understanding Fiction. Hinton's more recent stories can be found in Aethlon, The Chariton Review, Enigma, Happy, Snowy Egret, and Weber Studies, among others. ISBN: 0972388516, paper, 5.5" x 7", $16.00, 288 pages. ISBN: 0972388508, hard back, 6" x 7.5", $25.00, 288 pages. Available through www.amazon.com and quality bookstores nationwide.